Bobby Jindal has a well-earned reputation as one of America’s most successful governors and one of the boldest innovators in the health care and education sectors. Jindal’s agenda included top-to-bottom reformation and privatization of the state-run charity hospital and the state’s healthcare payer systems. 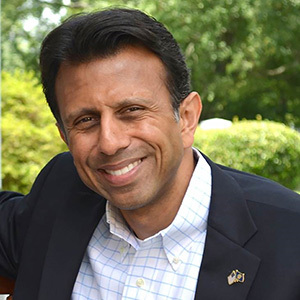 Fiscally, Jindal reduced the state budget by 26%, reduced the state employee headcount by 30,000, and implemented the largest income tax reduction in state history. With a bipartisan consensus, Jindal implemented statewide school choice programs and moved the state from the bottom five in ethics laws to the top five, according to independent analysts. Jindal’s dramatic rework of Louisiana’s policy structure paid measurable dividends in the form of eight credit upgrades, $60 billion in private capital investment and a ranking in the top ten in the nation for job creation and the highest ever per capita income ranking in state history. Despite being the nation’s youngest governor when he was elected in 2007, Jindal had been well-prepared to become the state’s CEO, with stints as the head of the state Department of Health and Hospitals, as president of the University of Louisiana System, assistant Secretary of the U.S. Department of Health and Human Services, and executive director of the National Bipartisan Commission on the Future of Medicare—all before his 30th birthday. In the private sector, Jindal advised senior management of Fortune 500 firms as an associate at McKinsey & Co. Jindal analyzed potential acquisition targets, assisted with product launches, and evaluated manufacturing processes versus best practices. Jindal managed teams of clients and consultants and aided healthcare payer, pharmaceutical, manufacturing and information technology clients.